I picked up a 4-pack of these from Macello's on that beer run a week or so back... I've had it before and enjoyed it so it was time for another round. I poured the beer from an 11.2 oz. bottle into a Chimay goblet, any Belgian style goblet/tulip glass will work for Belgian ales. 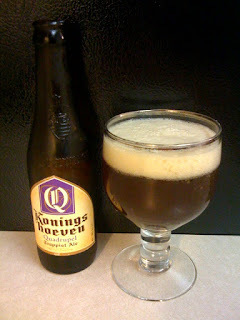 It has a ruby red color to it with a thin off-white head that leaves some creamy residue on the surface of the beer. The smell is just what you want in a Belgian quad... floral hops, spice, coriander, some definite fruit smells like apple and berries. Very well blended together. The taste bring all those smells together... nothing overpowers the other flavors, or the strong 10% abv. The fruit probably comes out the most, with the brewing spices blended in. Mild hop profile but still there in small amounts. Just delicious, one of my all-time favorites. There is definite carbonation, and the beer is lighter than dark stout or something along those lines but it still has a great mouthfeel to it. Easy to swish around a bit to pull out all the flavors, no bad aftertaste at all. If it wasn't at 10% abv, I could drink these all night long! It might have earned a spot in my top 10, fantastic beer. And... three random thoughts: Peterson's interception yesterday would have been good in the NFL, no clue what that replay official was thinking... there was still no guarantee that we would drive the field and score to take the lead, but after the FG and all the extra time off the clock we were pretty much dead. I also hate that 'running into the kicker' rule... I can understand a defender should be able to dive into a kicker's plant-leg or just crush him after the kick is off, but just running into his kicking foot... that was weak.